Before I begin, I just want to say congrats to Jessica, the host of this link up, on the upcoming arrival of her newest little bundle of joy! Congrats, girl! ...you know when somebody pays you back for something you picked up/paid for...dinner, a coffee, an item from the craft store, something on sale? Well, once I'm paid back I always tend to keep the cash for myself. I don't deposit it into our checking account or spend it on groceries. It's a selfish act, I know. What do I do with it, you ask? Welp, I either buy myself a couple of lattes throughout the week or I make a special trip to Hobby Lobby. ...once Jon hits-the-hay at night I tend to stay up a bit longer. During that time I, more times than I'd like to admit, bust out the junk food. Chips, chocolate, a hidden cookie from the day before, the works. I don't have to share with anyone and I don't have anyone looking at me with "judgy-eyes." And because, well, "Joey Marie doesn't share food!" ...when Jon pulls in the driveway after a long day at work, I sometimes pretend that I'm super busy! Sure, most days, about 360 days out of the year, I'm honestly, truly swamped. But there are some days when he comes home and I'm on the computer or texting/playing on the phone. He's just had a long day at work and here I am in yoga pants, scrolling though Facebook, while the kids are watching Paw Patrol. This. This makes me feel guilty. It's kind of funny - I'll start doing the dishes or get out the broom or go downstairs to bring up the laundry. He has to be calling "bull." I mean, it must be completely obvious that I'm just starting a chore and nothing else looks accomplished. Or everything is already done - what more could I possibly be doing? All the more reason to rock out my messy hair, no makeup, and yoga pants look - it adds to the effect. ;) LOL! 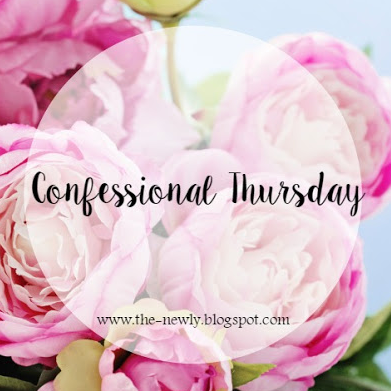 I'm linking up with Jessica from The Newly for Confessional Thursday. Oh my gosh, Marie, I am cracking up! You seriously crack me up every time I read your blog! I totally do that sometimes when Brian comes home from work. Most of the time I AM busy, but occasionally I'll be working on a blog post or something, but as soon as I hear his car pull in the garage I jump up and start doing laundry or cooking or something. Lol. I always feel guilty if I'm doing non-house related stuff and I don't even know why! These are great. I know that I sometimes will act busy when Rory gets home from work or out somewhere. I want him to know that I just didn't sit there. Exactly. Why do we do this to ourselves? LOL! I totally pocket that money, too. I hardly ever buy things for myself, so it's all MINE!